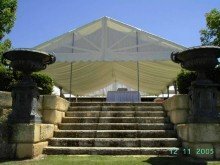 Spuds Marquee Hire is one of Perth’s most sought after marquee hire companies. For more than 20 years we have provided superb event marquees for weddings, field days, corporate events and private functions, at home, or at the location of your choice. Whether you’re planning an intimate gathering, or a function for a small group or several hundred guests, we have the marquees and finishing touches to ensure your event is a complete success. Our wedding marquee hire helps Perth couples to provide their family, guests and assorted attendees with shelter and shade through all kinds of weather conditions. Anyone who requires a marquee for weddings in Perth, should get in touch with us – not only do we have a wide range of choice, our wedding marquee hire is truly affordable and available to suit your needs. 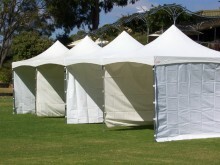 Get in touch with us at (08) 9370 2936 if you need marquee hire for absolutely any event. 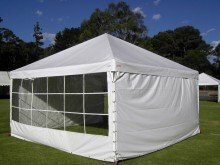 It’s truly easy to talk to us about your exact shade and shelter needs: we have provided marquees for a large variety of clients, and pride ourselves to supply and install suitable marquees for your individual requirements. Absolutely recommend this company. 5 stars isn't enough.Steve came out for a quote and the ideas he suggested for my wedding made it so easy and affordable. Contact with Charmaine was awesome and she organised times to come out. Steve and the boys came out before the event and set it all up and made sure that I was 110% happy before they left. When they returned to pull it all down they were on time and very professional.If you are unsure of the how and what, then Steve is the guy to talk to. You can tell he has had years of experience dealing with brides. Highly recomend Spuds marquee hire for any event. Domestic, commercial, weddings, parties and festivals.Top guys..! I was a very undecided, should I get a marquee, shouldn't I get a marquee, I spoke to Steve who was really helpful and didn't put me under any pressure about time limits or availability of tents actually in the end they came and put up the marquee the day before the event. The guys who put up the marquee were great, they even made space so I could re-hang the fairy lights.I would definitely use them again and they would be my first call.Thanks again.